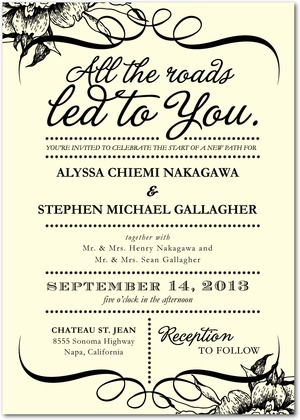 All the Roads elegant wedding invitations from Wedding Paper Divas are a sublime choice for your celebration. This bold, ornate design features stunning script and typography, as well as illustrative floral accents. Available in the following colors : black, majestic, aqua, and sienna brown.